Explanation: How much mass do flocculent spirals hide? The featured true colour image of flocculent spiral galaxy NGC 4414 was taken with the Hubble Space Telescope to help answer this question. The featured image was augmented with data from the Sloan Digital Sky Survey (SDSS). Flocculent spirals -- galaxies without well-defined spiral arms -- are a quite common form of galaxy, and NGC 4414 is one of the closest. Stars and gas near the visible edge of spiral galaxies orbit the centre so fast that the gravity from a large amount of unseen dark matter must be present to hold them together. 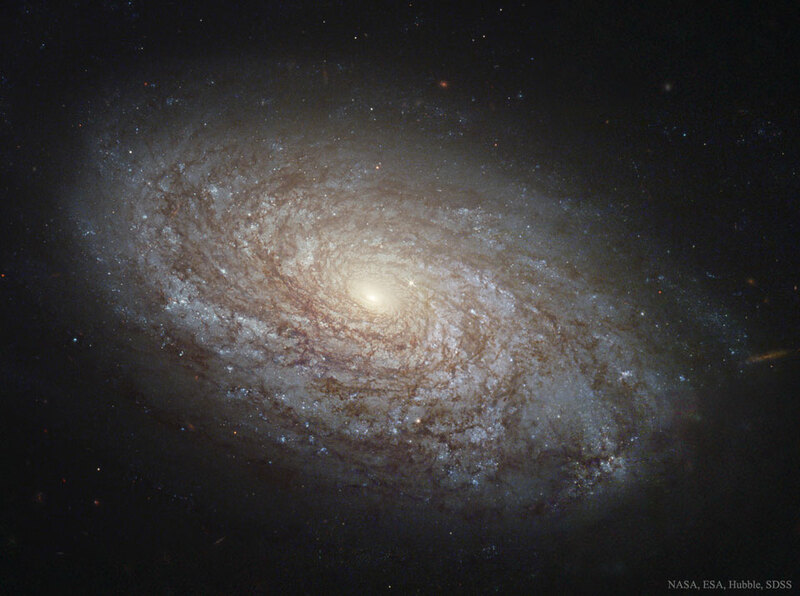 Understanding the matter and dark matter distribution of NGC 4414 helps humanity calibrate the rest of the galaxy and, by deduction, flocculent spirals in general. Further, calibrating the distance to NGC 4414 helps humanity calibrate the cosmological distance scale of the entire visible universe.